4 Burning Questions: What Team Must Regroup This Easter Break? Home / 4 Burning Questions / 4 Burning Questions: What Team Must Regroup This Easter Break? What to Make of a NASCAR Off-Week for Top Teams? Aren’t NASCAR fans the most spoiled sports fans in America? One off-week and they’re ready to call for immediate medical help. But, yes, here we are again for the first race-less weekend of 2017. But be thankful, as after all, it’s Easter. The teams, drivers and media will get time with family and a little time away from the spotlight. But who’ll be specifically happy this off-week? I can tell you there will be a few, instead, painting their Easter eggs red. Let’s start with those negatives. Joe Gibbs Racing is the first on the list of surprises, as only one of four cars are in the top 15 in driver points. That’s Kyle Busch, who has had a solid first seven races, with two top fives and the second most laps led, only six laps less than leader Kevin Harvick (413 to 419). Other than the 2015 champion? Ouch… literally. Matt Kenseth took two of the harder hits of 2017 in succession at Phoenix International Raceway and Auto Club Speedway, when a SAFER barrier ended his days early. The No. 20, while sitting 22nd in points, is the lowest-ranked driver with three top 10s, six spots behind Kurt Busch. Additionally, with the news of an unexpected press conference for April 19, that raises a few questions and what will be announced for the 2003 champion. For the remaining two in Denny Hamlin and Daniel Suarez, the expectations were fairly distant. Suarez has done well in the No. 19, earning back-to-back top 10s, but is the lowest JGR man in 23rd. By now, Hamlin is expected to contend for wins right off the bat each season, and he has failed to do so in seven races. In fact, it’s the first time since 2011 Hamlin hasn’t scored a top five in this point of a season. Boy, they could use a colorful week to regroup, huh? These next few have no idea what they’re talking about. Of course, they shouldn’t, as 2017 has been highly enjoyable thus far for each. Leading the way is Jimmie Johnson. He spent a whole offseason with a beard-covered smile, and it is back for this off-time. A victory last week at Texas Motor Speedway puts his Hendrick Motorsports team in the playoffs and out of concerned headlines… at least for a few weeks. 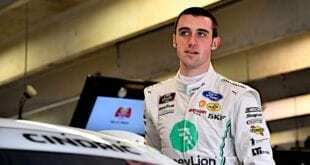 Joining him is Ryan Blaney and Wood Brothers Racing. If momentum is a thing, they’re probably a little disappointed there isn’t a race this weekend. Man, qualifying outside pole and spending 148 laps out front at Texas can give you a kick in the shorts. Just in time for spring. What is Fernando Alonso Thinking, Anyway? A throwback, an epic day or a shocking realization. Call it what you want, but Wednesday (April 12)’s Twitter timeline was full of reactions after Formula 1 champion Fernando Alonso announced he will partner with McLaren, Honda and Andretti Autosport for the 101st Indianapolis 500 next month. OK, he may have typed “exited” instead of “excited” in his tweet saying so, but we all know now how thrilled he is to participate in America’s largest race. “The Indy 500 is one of the most famous races on the global motorsport calendar, rivaled only by the Le Mans 24 Hours and the Monaco Grand Prix,” Alonso said. “It is definitely completely different skills that you need, different driving technique that I’ll have to adapt myself. Confidence is there already, but man, where did this come from? Since when does a full-time Formula 1 driver take off a weekend, especially F1’s biggest event in the Monaco Grand Prix, and go try something else? More than a half-century ago, dating back to the 1960s when drivers were less specialized and did far more back-and-forth than ever imagined today. To do it today while actually skipping a grand prix? Well, let’s just say not many others in the F1 paddock would do the same. So it seems Alonso is a little different. Some say the two-time champ has been held back in much of his career, getting the raw deals with even the highest teams. Now he is floundering with McLaren-Honda’s struggling power again in 2017. Alonso has said it: he’s at the prime of his driving career. So, where is the real challenge for the Spaniard? It’s no fun leaving the circuit happy because you scored a point. That’s not a racer’s mentality. The challenge is at Indy, the world’s biggest race. Good on him. Will Haas F1 Team Benefit from Momentum? Like 2016, Haas F1 Team is already in the points to start a Formula 1 season. With first-year driver Kevin Magnussen scoring a strong eighth-place last week in China, the team is happy to have another grand prix this weekend. And it’s a good one for it, too. Haas was one of the shockers of last season’s early weeks, being a new team backed by Ferrari and their VF-16. Kicking off its career with a sixth-place finish in Australia with veteran driver Grosjean, the best was yet to come. The following round at Bahrain saw an uptick, with a fifth by Grosjean despite an early retirement by teammate Esteban Gutierrez. Can the team back it all up with its first double-points race? It was darn close last week, as Grosjean finished 11th. In fact, that result was the 10th time in 23 races it finished one spot shy of the point-paying top 10. It could be a perfect fit, hot off some hard-to-get momentum and its best racetrack in a short career. Will Felipe Massa End Career With On-Track Success? Felipe Massa was one of those who would have to think twice about skipping a grand prix to race elsewhere. Then again, he almost wasn’t racing at all in 2017. After Valtteri Bottas was tapped to replace retiring champion Nico Rosberg at Mercedes, it was in Williams’ best interest to bring back a grand prix winner to assist rookie Lance Stroll this season. In the end, it will likely prove to be a benefit on all sides. Less cars will be damaged, more points will likely be attained and the young Canadian will have one of the most experienced current F1 stars at his disposal. But for Massa, how long will he stick around? Because sticking around seems to be his presence in 2017. Starting the season with a sixth in Melbourne was a solid start to his 15th season, marking a third straight year finishing well in the points in round one. A 14th in China, however, was partnered with a first-lap crash for Stroll that leaves the team a little behind for this weekend’s event at Bahrain International Circuit. Once again, it’s a new place for Stroll and a happy place for Massa, who won there twice in 2007 and ’08 with Ferrari. But with success at nearly every racetrack this year, the question is if the 35-year-old Brazilian will make something of this season. He’s still running on a winless streak that dates to 2008 and hasn’t scored a podium or lap led since 2015. Every driver wants to end his or her career on top like Rosberg, but Massa’s legacy may end on the shoulders of Williams and Stroll. Unless he can perform himself. Next NASCAR 101: Is An Early Week Off Good or Bad for Your Points Leader? Most of Kenseth’s problems this year are caused by other drivers mistakes. But Gibbs as a whole is off, way off, due to the 800 pound gorilla in the room. They need to sit the staff down and tell them life will still go on as usual after the Mexicans take over the operation next year. Fernando to Indy is probably about several things. (1) the McLaren F1 program is a disaster, largely because of the Honda lump in the back. This gives everybody a chance for Honda to throw Fernando a bone in a highly visible setting with low expectations. At the same time McLaren shows a commitment to Honda in the same situation. Indycar will be smiling as well, so seems like nothing but winners all around. When a “safer barrier” ended Kenseth day(s)? OMG is this like the MSM throwing cute little puppy pics and kitten smiles when they glossed over Hillary’s obvious sins!!!!! DISTRACTION FROM THE TRUTH! It is amazing the willful narrative that the NASCAR media spins. Matty’s hit into the wall at the AUTO CLUB SPEEDWAY was 100 percent MARTY TRUEX getting into him! NOT A PEEP ABOUT MARTY doing the deed….while telecast live and print after the fact, the obvious was ignored, shocker!. Apparently so did Matty, how charitable of him, he is always so caustic, bitter, vengeful when that happens to him via another driver..Hypocritical and prone to a double standard is more like it! How flucking insane are these people? If it was a Penske car just “racing” (and it is racing) it would not be RACING. It is a DAMN catastrophe, if Team Penske did the Marty deed! The cozy “safer barriers” line would not see the light of day! Brad K or Joey Logano would have their names smeared all over this stupid article….come on. Racing deal!!! But why isn’t a racing deal when a Penske driver does it? You exaggerate, make a story that should not be, and hound anybody from TEAM PENKSE till the next week, as if they have done something spiteful, hateful, with malice and a rivarly will surely happen! And nobody had EVER DONE THAT MOVE BEFORE! Does nasty Marty have a lifeline to God we are not made aware of and us humans should follow Matty’s charitable say nothing attitude? Silly us…I am confused they rant so often when it is Penske driver and then they don’t when it is a Toyota driver. I get confused when the rant is of a personal, bitchy, whiny nature..and when it isn’t. Cause it always seems like racin’ to me.